The lockers we knew in our youth are now skipping school and coming home to serve as a unique and versatile storage solution for a new class of nostalgic homeowners. Remember twisting the dial of your combination lock to retrieve a textbook from your high school locker? Well, you’re not the only one. Lately, plenty of nostalgic graduates have been repurposing lockers for use in the home. Look for lockers in thrift shops, salvage yards, and used furniture stores. Typically, they come fastened together in a set, so in order to fit one into a tight space, you may need to remove a few screws first. Consider your finishing options too. With paint, you can make your lockers match your decor, or you can embrace the vintage look, in all its scratched (or even graffitied) glory. 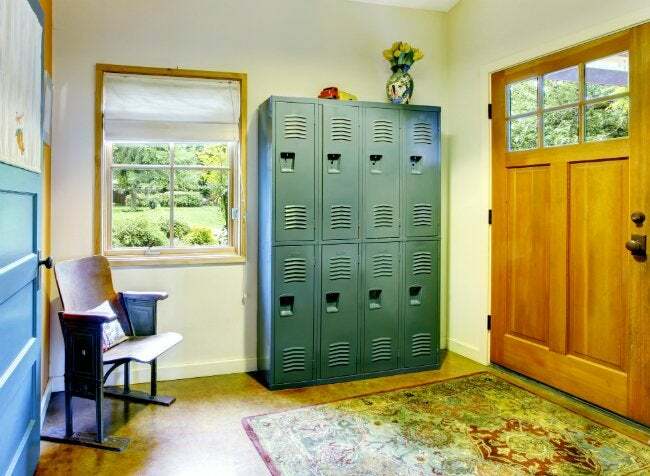 Lockers with vented doors are great for stashing gym gear in the mudroom or entry hall, while units with rods or hooks for clothing are perfect for kids’ rooms or laundry areas. That’s not all, though; lockers are surprisingly versatile, with dozens of potential applications around the house. Some especially creative folks have even put their vintage finds in the kitchen or pantry.